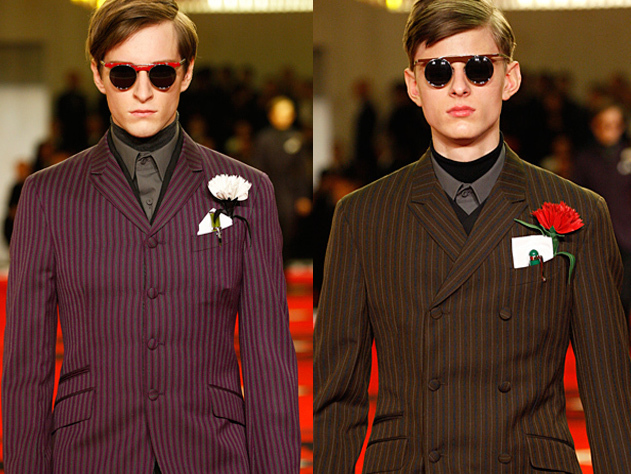 Power is around every corner in this FW12 Prada Men’s show. True that Gary Oldman walking the red carpet exaggerates the tension, but i have to admit the clothes itself and the styling is still generating the power originally. 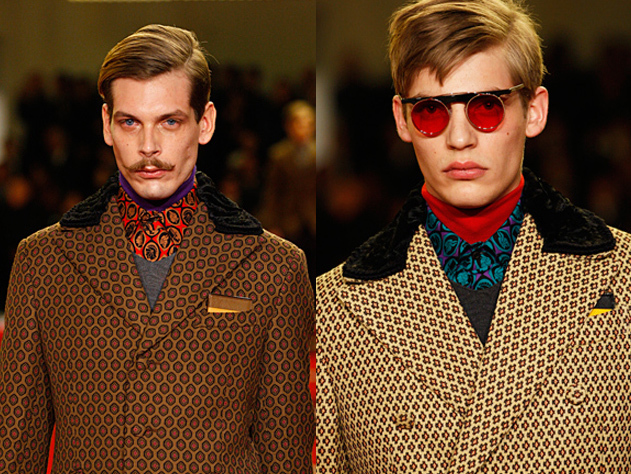 Miuccia Prada always brings us surprises whenever new collection launches. 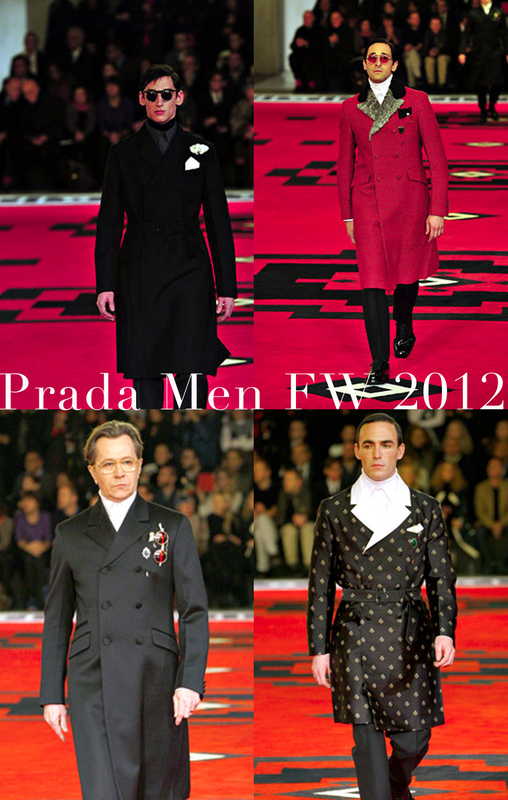 This time she gives us gentlemen from the post World War II with an Victorian accent – white turtleneck underneath, double breast long coat and pocket ornaments. Despite everything about power women and unisex thing, suits are Men’s fate. No fussy, just the tailored cut, with minimal ornament and cordial colour. Madame Prada shows us the chicest accessories possible on pockets, sunglasses, check! Floral neckpiece, check! Brooch, check! Yes! We almost forget all these little things for a gentlemen. And yes we are so blind to explore the subtlety of colour, how pinstripes and graphic pattern could possibly become to harmony. After all these gentlemen’s package, the outfit itself generate power, the power of neatness, power of a la mode, power of formality. realli feel the pretty isabel marant coats!! 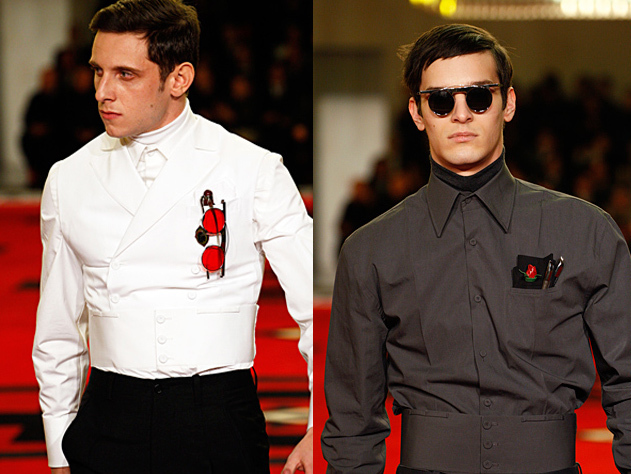 i am so stucked with the garcon style! As always Vanessa Bruno plays her tricks to express feminity in terms of fabrication and colour. This time the boho style impressed a lot! The grey colour works incredibly well with brick red here, they are intense yet harmony. It gives a certain way of softness. they could be used as accessary to create layering, how versatile it is! the embellished and printed dress are so gypsy, and kind of bohemian style, it looks like the girl from 70’s coming alive. 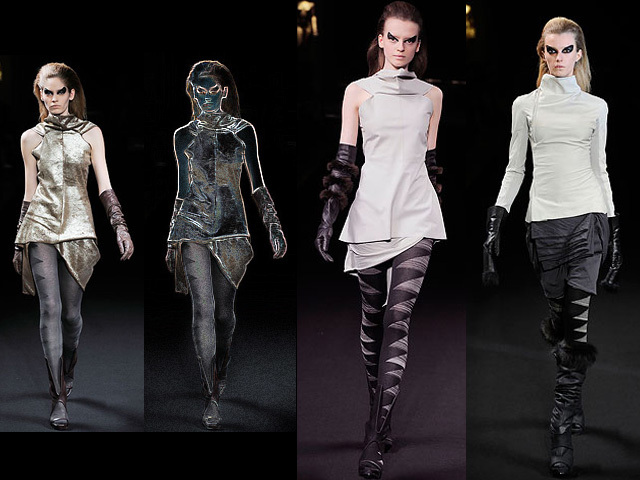 Without specific reason Rick Owens Fall collection is my second favourite after the sweetie ice princess collection of Chanel. May be it’s the fierceness that as make up…attracts me; or perhaps it’s the asymmetrical cutting and the contrasting between soft and crispy material. Or it’s the leather gloves that so long enough to cover the arm….. Besides of the dark, the most weird embellishment making of horn is such an amusing detail that spicy up the fierceness. That’s just the right outfit for modern beauty – yes, to let everyone knows how TOUGH girl can be! More likely what it happened in the tribal ancient – dare enough to wear bones on body. Forget the dark side of the moon, look at the form creates on the wrapping dresses…..should i claim it as the statue of goddess? 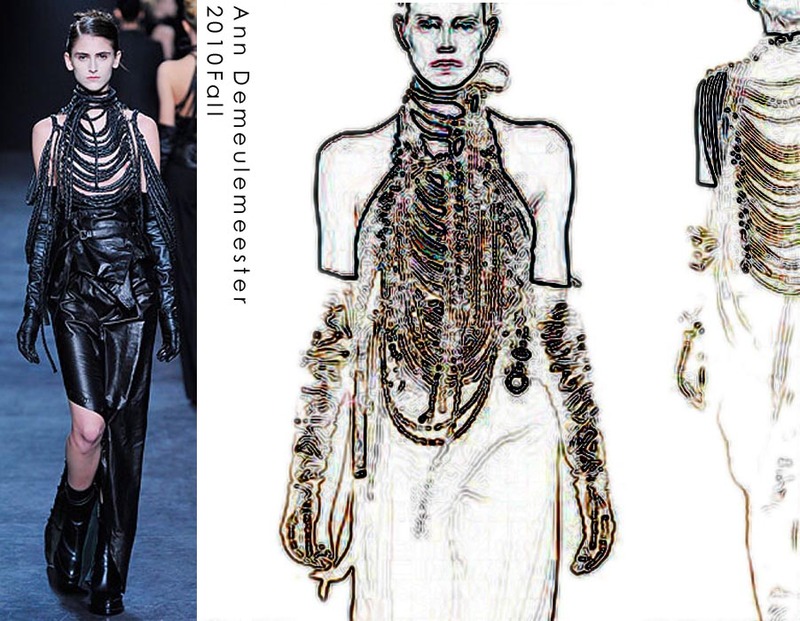 Pleats intruding fron the right place to give curves, following a long asymmetrical trail at side, yes, this is avant version of goddess. How could it be possibly to have a walk on the water on snow mountain, just a glance to the Chanel show, you can tell yourself you’re not dreaming. 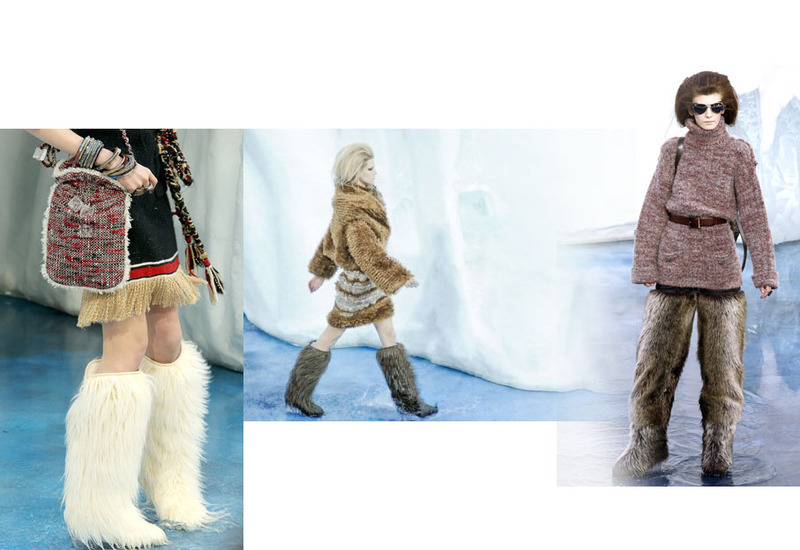 white lace tier x chunky fur boot, young girls can’t help but loving it. Classic tweed style in new texture x chunky boots, again young and chic. 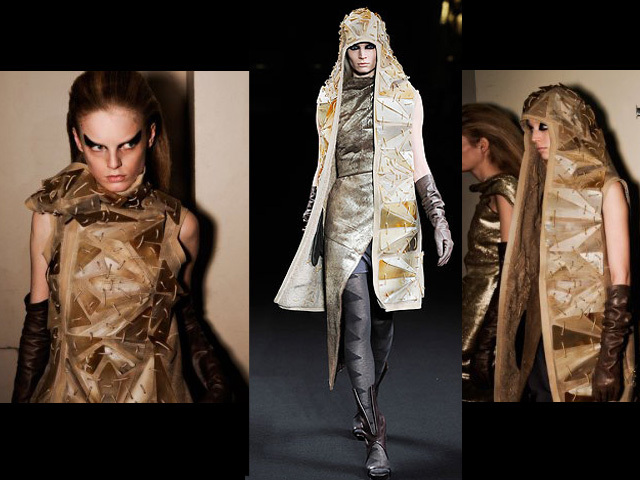 Layering doesn’t mean surrounding your body with clothes literally. 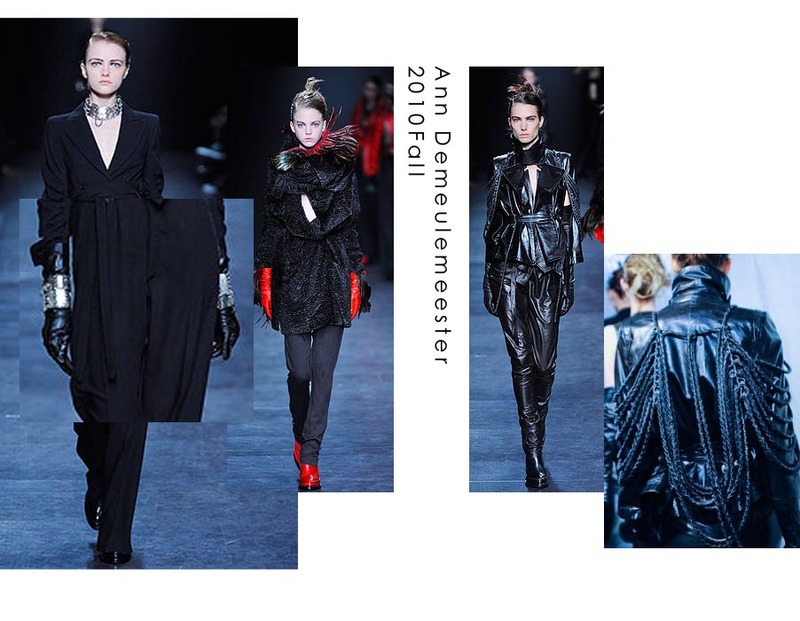 Sometimes the outfit itself serves as accessaries and textures, hence creating incredible layering effect – spotted from the fall/winter collection 2010 of Ann Demeulemeester. everything is that simple yet interesting on the outfit…. the feeling of fierce and cold co-expressed on the same garment. 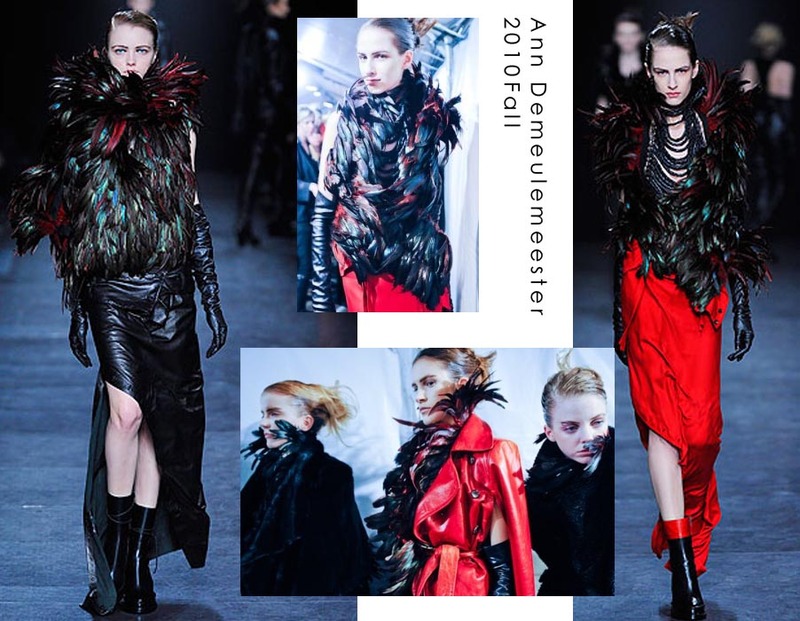 The fringe & feather details are definitely a surprise in this dark and gothic collection. 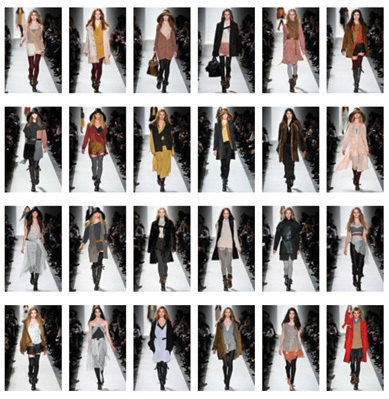 This is the first fall collection of Sharon Wauchob that i can find on style.com……finally she sits in the brand lists. It feels so cool to preview the entire collection without any pre-selection from the local buyerssss. Everything is simple yet feminine. 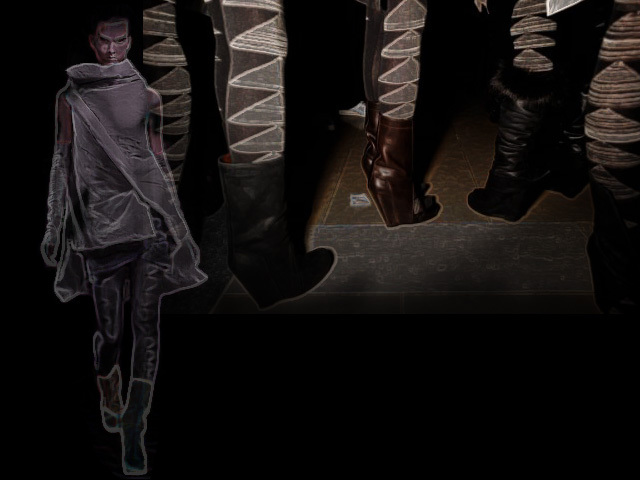 Though the leather strips draw all the attention you can’t taking your eyes off the draping and fluidity the garment creates.